The head of U.S. Bancorp since 2007, Richard Davis, is ceding control over the bank later this year. U.S. Bancorp chairman and CEO Richard Davis. Image source: U.S. Bancorp. One of this era's most successful bankers has decided to relinquish the reins. U.S. Bancorp (NYSE:USB) announced on Tuesday that chairman and CEO Richard Davis will step down from his role as CEO at the bank's annual meeting in April. He'll stay on as executive chairman of the board, while President and COO Andy Cecere will succeed him in the corner office. "At age 48, I was named CEO of a great institution called U.S. Bank. Serving as CEO for the past 10 years has been the most rewarding and fruitful period of my 41-year career as a banker," said Davis. It's hard to overstate what Davis accomplished at the helm of U.S. Bancorp. Most importantly, he led the Minneapolis-based lender through one of the most harrowing periods for banks in the past century, and the way in which he did so enabled the bank to emerge from the financial crisis bigger and stronger than it entered it. The ability to gain strength from chaos and crisis is a unique quality that only the finest and most ably run corporations exhibit. Nassim Taleb refers to companies that fit this description as being antifragile. This quality is especially rare in the bank industry, given the combination of high leverage and the unforgiving vicissitudes of the credit cycle which has led to the failure of thousands of banks over the years. The keys to U.S. Bancorp's success under Davis are grounded in the fact that it's one of the most efficient banks in the country. Its efficiency ratio consistently hovers in the low-50% range, meaning that it spends just over half its revenue running the bank. Most of U.S. Bancorp's peers, by contrast, tend to have efficiency ratios in excess of 60%. It seems obvious why this matters -- the less a bank spends on operating expenses, the more revenue that's left over to distribute to shareholders and grow book value. But this masks how much discipline it takes for a bank to operate efficiently. It means that salaries will be lower. That offices won't be as opulent. And in U.S. Bancorp's case, that its employees don't get free coffee. In short, it's everything that most people don't associate with banking. By operating efficiently, moreover, U.S. Bancorp minimized the incentive to pad its pockets artificially by underwriting higher yielding but riskier loans. This is all too tempting for banks and is one of the principal reasons that the efficiency ratio correlates closely not only to profitability, but to loan losses as well. These traits, embedded in U.S. Bancorp's culture by Davis and his predecessor, Jerry Grundhofer, fueled an impressive surge in U.S. Bancorp's stock over the past decade. Even though the $450 billion bank has consistently distributed three quarters or more of its earnings to shareholders through dividends and buybacks under Davis' watch, its book value per share has still more than doubled since the beginning of 2007. USB Book Value (Per Share) data by YCharts. Including dividends, U.S. Bancorp created just under $40 billion worth of shareholder value while Davis was its CEO. 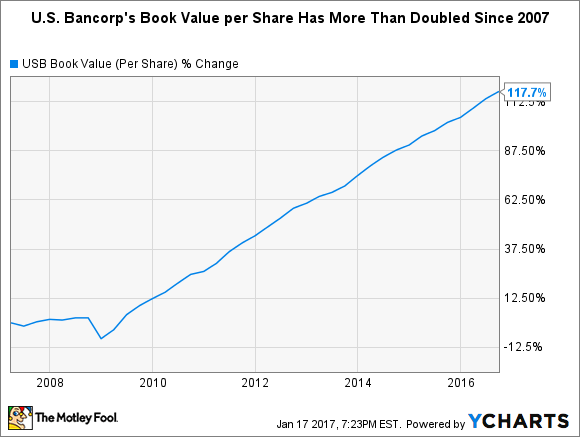 That's split between a $22 billion increase in book value (book value per share multiplied by outstanding share count) coupled with $16 billion worth of dividends. At 58, Davis is young to retire. He isn't going away completely, as he'll still be the chairman of the board. But this arrangement is likely to be temporary if Davis follows his predecessor's example, who relinquished his role on the board a year after he stepped down as CEO. There's no better way to conclude a marvelous career than to go out on top on your own terms, which is exactly what Davis is doing.